Artist Henry J.P. Billings was not pleased when his painting Opus No. 1 was accepted into the annual exhibition of the Art League of Springfield, Mass. Nor was he flattered that the art critic of the Springfield Union described the painting as a "welcome surprise," saying that it was better than Mr. Billings's typical works. He was upset because the painting, he revealed, had been a deliberate attempt on his part to draw badly. He had designed it to violate every known rule of drawing, design, and color. "Juries," he fumed, "should be selected who have background enough to distinguish good from bad in modern art." He angrily resigned from the Art League in protest. The backstory to Billings's protest was that there had been great disagreement among the members of the Springfield Art League over the decision to import three outside jurors to judge the members' work for the 1938 exhibition. Some members, such as Billings, who were proponents of a "conservative" style of art, felt that the jurors were too inclined to encourage modernistic art. Billings designed his stunt to reveal their bias. 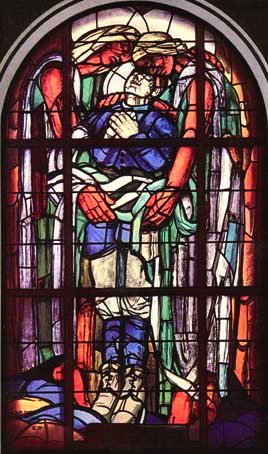 However, his stunt backfired because after his "horrible example" ran in a number of publications, one reader noticed it was very similar to part of a stained glass window titled "The Soldier" by the acclaimed modern French artist Georges Desvallières. A photo of Desvallières' stained-glass design had recently appeared in the magazine L'Illustration. Upon being confronted with the similarity, Billings admitted that he had used the french artist for "inspiration" — a fact he had previously failed to mention. This admission took the wind out of the sails of his protest. A correspondent to Time magazine noted, "The jurors showed more discernment than anyone supposed; they saw the good of Desvallières shining through the bad of Billings." "Shining Through". (Apr 11, 1938). Time magazine. "The case of artist Billings has an unexpected ending." (May 6, 1938). The Kansas City Star.